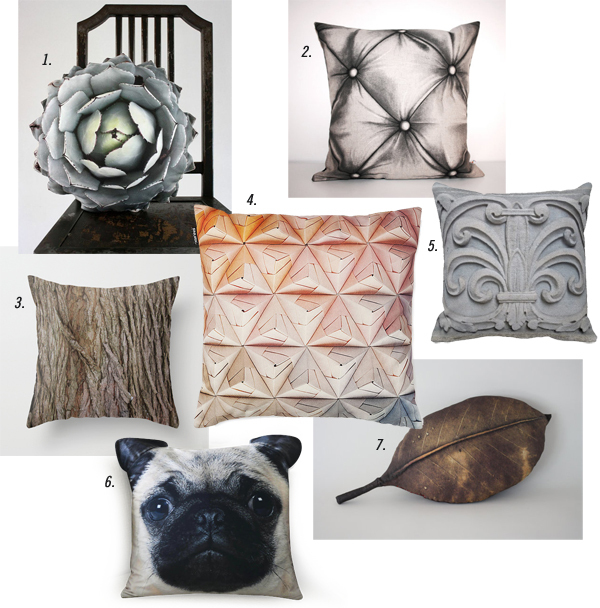 These photo-realistic throw pillows are whimsical and fun. I'd be curious to see how the three dimensional illusions hold up in person, but they look very cool in photos. Maybe we should try a DIY version– take a photo, print it on transfer paper, and iron it onto fabric. Or for higher quality, print the fabric at Spoonflower and sew it into cushions. Wow, those are cool! I think you should get #5 for your house. Congratulations on your first place finish, Mum. Thanks! I got gold!!! Where's my medal? Yeah, that looks more like you. I'd go for #3 and put it in the basement. I love these! Especially #2. I just love the idea of a trompe l'oeil cushion of a cushion. Oh my gosh that pug pillow is so funny and cute! Wah! The bark pillow! Love it.